The Carhartt Legacy Women's Hybrid Convertible Backpack Tote Bag is a versatile bag built to function as a backpack or a tote bag. Switch easily between wearing as a backpack and wearing on the shoulder; the clever pull-through strap system allows the backpack to be converted on the fly. Constructed of a rugged fabric with Rain Defender durable water repellent, it has a large zippered main compartment with a padded laptop sleeve and two additional pockets. The Carhartt Legacy Women's Hybrid Convertible Backpack Tote Bag has two exterior side compartments for additional items and a secure zippered pocket for a cell phone or keys. This convertible tote bag features YKK zippers, metal hardware, triple-needle stitching, and the Carhartt logo patch. Measures 17h x 14.5w x 3.5d inches, and weighs 1.5 lbs. All Carhartt work bags, packs, and gear are covered by a Limited Lifetime Warranty. 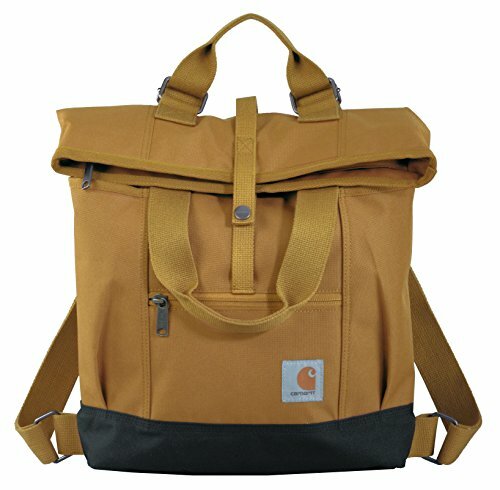 Carhartt convertible backpack measures 17h x 14.5w x 3.5d inches, and weighs 1.5 lbs.